To celebrate the holy birthday of Amitabha Buddha, the United International World Buddhism Association Headquarters (U.I.W.B.A.H. 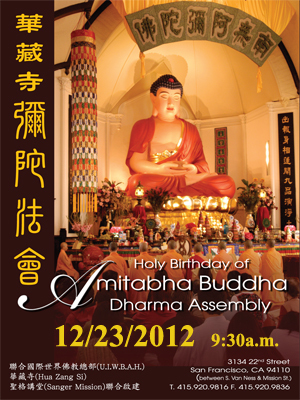 ), Hua Zang Si and Sanger Mission will jointly hold The Amitabha Buddha Dharma Assembly at Hua Zang Si in San Francisco on Sunday, December 23, 2012 at 9:30a.m. Date 日期： 12/23/2012 (星期日） 9:30a.m.